Ex-soccer star Kakha Kaladze has scored his biggest win on Georgia's political field by getting elected as Tbilisi mayor, the main prize in the country's October 21 municipal polls and a potential springboard to higher political office. Though the election registered considerable voter apathy in Georgia, the victory prompted enthusiasm in Italy, once Kaladze's soccer home base. The Italian salutations included Kaladze’s former AC Milan buddies. “Congratulations to the new mayor of Tbilisi, I am so happy for you!” football legend Paolo Maldini wrote on Facebook. Even Silvio Berlusconi phoned to offer his best, said Kaladze’s party, the ruling Georgian Dream. Kaladze appears to have won this one without a playoff. Preliminary results give him over 51 percent of the vote. Runoffs are pending in several cities, including Georgia’s second-largest city, Kutaisi, where no candidate garnered the required 50 percent of votes. But most of Georgia voted blue, the ruling Georgian Dream’s color, concentrating further political power in the hands of the government, which already holds a parliamentary supermajority and, thus, a legislative carte blanche. The party’s candidates prevailed in most mayoral and city-council races nationwide. Kaladze’s life-giving promise has been featured in omnipresent posters, a stream of video selfies on Facebook and media appearances. Billboards featured the photogenic 39-year-old with his wife, three kids and dog. His face smiled at voters from Tbilisi's city buses. Helpfully, the buses already are blue, but, for good measure, the city government painted electricity-transmission towers blue as well, some Tbilisi residents say. Kaladze also made full use of his sports celebrity power, gaining endorsement for his mayoral bid from soccer stars such as Italy’s Gennaro Gattuso and Ukraine’s Andriy Shevchenko. Complete with feel-good songs and positive messaging, his campaign branded Kaladze as all about happiness. Yet despite Kaladze’s win, how far that went over with voters is debatable. As in Georgia’s last parliamentary and local elections, less than half of all registered voters made it to the polls, commented Davit Sichinava, an analyst with Caucasus Research Resource Centers. “This is problematic as it could indicate a diminishing public interest in politics,” he said. The Tbilisi mayoral race also demonstrated sagging public support for Georgia’s scattered opposition groups, he added. Independent candidates posted gains over established opposition parties, with eco-city enthusiast Alexandre Elisashvili finishing second after Kaladze with 17.5 percent of the vote. International observers said that the election, overall, was decently handled, but noted overwhelming financial and administrative odds in favor of the Georgian Dream. The party received 91 percent of all private donations, according to an observation mission of the Organization for Peace and Security in Europe. Such reports are standard practice for a ruling party during a Georgian election. But there were some changes from the norm. 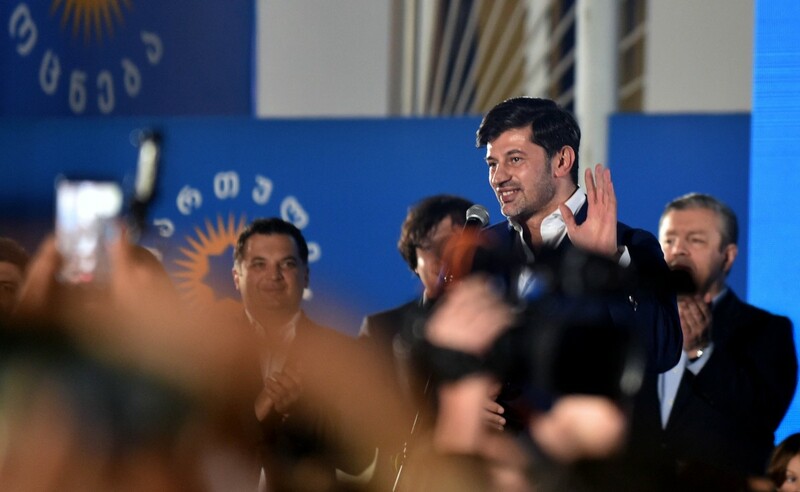 Breaking with past Georgian Dream campaigns, Kaladze didn’t take aim at the party’s chief rivals, the United National Movement. Avoiding “negative messages” and fights was a deliberate decision, Georgian Dream parliamentarian Mamuka Mdinaradze commented on TV. In another shift, the Georgian Dream’s billionaire backer, former Prime Minister Bidzina Ivanishvili, sat on the sidelines in this election. Ivanishvili avoided asking the public to support Kaladze, his protégé, or any other Georgian Dream candidates. Kaladze’s disgruntled rivals claim, though, that the tycoon continues to pull political strings. They’ve accused him and his party of voter bribery and intimidation. They assert that the Georgian Dream was corralling public employees to vote and even paying for votes. “I don’t think even the Georgian Dream believes in the results that came in,” scoffed Zaal Udumashvili, a Tbilisi mayoral candidate from the UNM and popular former TV anchor. If so, no sign of that now. -This post earlier stated that Georgian Dream enthusiasts had painted Tbilisi's electricity-transmission towers blue. In fact, it was the city government. The text was corrected on October 24, 2017.